[Thursday, May 1, 2008] After its successful launch and accurate insertion into its target orbit by the Fregat autonomous upper stage, GIOVE-B is now completing its Launch and Early Operations Phase (LEOP), which will shortly give way to the platform commissioning phase. [Monday, May 5, 2008] The Northrop Grumman Foundation is accepting teacher applications for the 2008 Weightless Flights of Discovery program, an initiative that places teachers on micro- and zero-gravity flights to energize students in the formative middle-school years. [Tuesday, May 6, 2008] The Astrobiology-based game by Electronic Arts is described as "an epic journey that takes you from the origin and evolution of life through the development of civilization and technology, eventually all the way into the deepest reaches of outer space." [Wednesday, May 7, 2008] Our mental framework has evolved, in ways not all together positive from the perspective of those of us who believe that the economic development of space is practical and indeed crucial to the continuing development of our planetary civilization. [Wednesday, May 7, 2008] The Boeing Company is seeking talented mission operations specialists with current NASA experience in the Houston area in support of its bid for NASA's Facilities Development and Operations Contract (FDOC). [Thursday, May 8, 2008] NASA engineers Thursday successfully completed the first series of tests in the early development of the J-2X engine that will power the upper stages of the Ares I and Ares V rockets, key components of NASA's Constellation Program. [Thursday, May 8, 2008] NASA will host a media teleconference on Thursday, May 15, at 2 p.m. EDT, to provide an overview of progress made in the last few months and work ahead for NASA's Constellation Program. [Thursday, May 8, 2008] NASA's Kennedy Space Center has awarded a contract to Hensel Phelps of Orlando, Fla., for the construction of the Ares I mobile launcher for the Constellation Program. »» Minister of Industry Confirms Initial Decision on Proposed Sale of Macdonald, Dettwiler and Associates Ltd. to Alliant Techsystems Inc.
[Friday, May 9, 2008] The Honourable Jim Prentice, Minister of Industry, today wrote to Alliant Techsystems Inc. to confirm that he is not satisfied that its application to acquire control of the Information Systems Business of MDA is likely to be of net benefit to Canada. [Friday, May 9, 2008] Scientists have visited one of the most inhospitable environments on the planet to carry out a challenging field campaign that is seen as the key to ensuring the data delivered by ESA's ice mission CryoSat will be as accurate as possible. [Wednesday, May 14, 2008] Scott Parazynski will be the first human to fly in space and summit the highest peak on our planet. We won't see a similar combination and alignment of first accomplishments again until someone summits the highest lunar peak - or Olympus Mons on Mars. [Thursday, May 15, 2008] "We write to urge you to enact a top-line increase for NASA's FY 2009 budget. Without this increase, our nation faces the very real risk of losing our uniquely critical industrial base and human space access capability." [Friday, May 16, 2008] NASA and the Northrop Grumman Corporation have reached an agreement that will enable NASA's Science Mission Directorate to conduct Earth science research with the Northrop Grumman-developed RQ-4 Global Hawk unmanned aircraft system. [Saturday, May 17, 2008] The goal of the Innovation Transfusion project is to increase the flow of new ideas into NASA by increasing connections between NASA employees and outside organizations that are creative leaders in areas that could benefit NASA missions. [Sunday, May 18, 2008] Without ISRU there simply is no long term human space program. Why? We simply cannot afford to take everything with us at prices exceeding two hundred thousand dollars per kilogram for the Moon and even more for Mars. [Sunday, May 18, 2008] NASA and the Small Satellite Division at NASA Ames Research Center (ARC) have recently teamed with industry and universities to develop fully automated, miniature spaceflight systems. [Monday, May 19, 2008] Do you have a great idea for the use of satellite navigation? If so you could win one of the prizes in this year's European Satellite Navigation Competition, supported by ESA through its Technology Transfer Programme Office. [Monday, May 19, 2008] GeoEye, Inc., a premier provider of satellite, aerial and geospatial information, announced an August 22, 2008 launch date for its next-generation, earth imaging satellite GeoEye-1. [Wednesday, May 21, 2008] NASA's Dryden Flight Research Center and The Boeing Co. are expanding the flight envelope for the X-48B blended wing body research aircraft. [Wednesday, May 21, 2008] The X PRIZE Foundation today announced four new teams in the Google Lunar X PRIZE, a robotic race to the Moon to win a remarkable $30 million in prizes, bringing the total number of registered teams to 14. [Thursday, May 22, 2008] The general public's interest in suborbital flying is now substantial. Such flights could offer a realistic opportunity to 'touch' space by experiencing weightlessness and seeing the curvature of the Earth's limb. [Tuesday, May 27, 2008] In close coordination with the EESMD, the Lunar Surface Systems Project Office at the NASA Lyndon B. Johnson Space Center (JSC), plans to issue a Broad Agency Announcement (BAA) for ESMD Lunar Surface Systems (LSS) Concept Studies. [Wednesday, May 28, 2008] NASA will hold a briefing at 11 a.m. EDT, Friday, May 30, to discuss new opportunities to use the International Space Station's unique research environment. The briefing will originate from NASA KSC and be broadcast live on NASA Television. [Wednesday, May 28, 2008] NASA/ARC is herby soliciting information about potential sources for providing aircraft operations and maintenance and research systems related aircraft modification at Ames Research Center and operation of the Moffett Field. 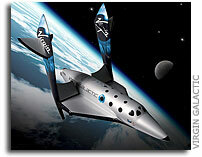 [Thursday, May 29, 2008] The National Space Society (NSS) and Virgin Galactic announced today the NSS Space Ambassadors Program, which for one person will lead to a trip to space on Virgin Galactic's SpaceShipTwo. [Thursday, May 29, 2008] ILS International Launch Services Inc., announced today that Khrunichev State Research and Production Space Center acquired the shares of ILS owned by majority shareholder, Space Transport Inc. Financial details were not disclosed. [Thursday, May 29, 2008] On June 6, NASA will release a broad agency announcement soliciting lunar surface systems concept study proposals to help the agency develop plans for a return to the moon by 2020. [Friday, May 30, 2008] Spacehab today announced that the company has finalized a Space Act Agreement with NASA for use of the International Space Station, a designated U.S. National Laboratory, for research, development and industrial processing purposes.